Avid do-it-yourselfers are no strangers to the idea of seeking out tools that make the job easier. Now, DIYers who focus their efforts on home improvement may find a new best friend in an app called DIYZ. Pronounced “dee-eye-wise,” the app seeks to impart knowledge and dish out expert advice on all manner of home improvement projects. Users can see step-by-step instructions and tutorial videos that can simplify the task at hand. For those who lack confidence in their DIY skills, having the app handy while tackling a home improvement project could be especially beneficial. According to a report, 41% of DIYers consider certain home renovations beyond their skill level. But even the most skilled DIYers may find new and useful information within the app. 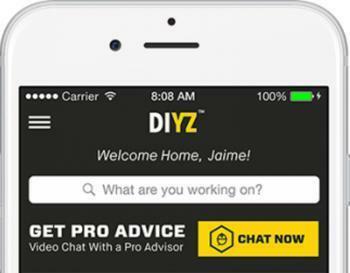 Matt Nestorick, DIYZ business leader, says the app caters to DIYers of all skill levels. Whether you’re fixing a plumbing problem, attempting to improve your lawn or garden, or getting to the bottom of an electrical issue, DIYZ can help with its user-friendly instructions and segmented how-to videos. Encounter a roadblock on your DIY endeavor? Let a pro help. A quick video chat with a Pro Advisor can help you cruise past your predicament and get back on track. In addition to comprehensive content and expert advice, DIYZ users will find that they are able to shop for recommended tools and materials right from the app. If you begin to suspect that your project isn’t very DIY-friendly, the app can step in and compare the cost of doing it yourself versus hiring a professional. An estimate of your project's difficulty level can also help you determine whether or not it's worth it to hire a pro. The app is available for free on the App Store and Google Play. For a limited time, users can video chat with a Pro Advisor for free. In the future, video chats will cost $10 for ten minutes and $1 per minute after that.